Glaucoma: Is this sneaky disease stealing your vision? Glaucoma could be silently killing dozens of vision fibers in your optic nerve right now without you knowing. This silent “thief of sight,” affects more than two million American over the age of 40, and that number could rise to four million by 2030, according to the National Eye Institute. That is why dedicating a whole month to spreading the word about this incurable disease is so important. January is Glaucoma Awareness month, and Scott & White ophthalmologist and director of the Division of Glaucoma, Derrick S. Fung, MD, said that more people need to know about this disease and how they can prevent permanent eye damage. If there are no symptoms, then how does someone know they have glaucoma? “The main way we test for glaucoma is to test the pressures in the eye and examine the optic nerve for damage,” the ophthalmologist said. If the pressure in the eye is high and the optic nerve is suspicious, more tests are conducted and the patient’s peripheral vision is tested. “We put all the pieces together and we can usually diagnose glaucoma in the eye clinic,” Dr. Fung said. Are there conditions that can put someone at higher risk of developing glaucoma? If someone in your family has glaucoma, you are at a higher risk of developing the disease than someone without a family history of the disease. And if you are African-American or Hispanic, you are also more likely to develop glaucoma. Being on steroids for COPD or other chronic diseases or having sleep apnea can also put you at a higher risk for developing the disease. 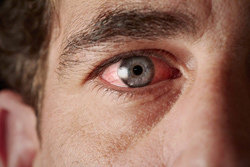 When the pressure in the eye gets too high, that’s when damage is more likely to occur. So, getting a regular eye exam and being compliant when the doctor prescribes medication is important to keeping the disease from causing further damage. It is important for patients with glaucoma to build a relationship with an ophthalmologist because glaucoma isn’t a one-treatment disease. For more information about Scott & White ophthalmologists and scheduling your eye exam, check out the Scott & White Eye Institute.